(autoinsidernews) - Toyota Motor Manufacturing, Kentucky (TMMK) celebrated the launch of production of the Camry Hybrid today Toyota's first hybrid vehicle to be produced in North America. Until now, all of Toyota's hybrid vehicles have been produced in Japan. Toyota is expecting to build approximately 48,000 Camry Hybrid vehicles per year, reports Trend. We are proud, excited and honored to be Toyota's first plant in North America to build a hybrid vehicle, said Steve St. Angelo, President of TMMK. It's a great tribute to the tremendous ability and skill level of all of our team members, who have been building the Camry, America's number one selling sedan. 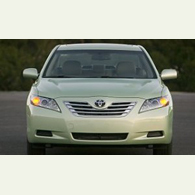 Last month, Toyota Motor announced that beginning in November the 2007 Camry Hybrid will receive a $300 increase in its retail price, up to a base MSRP of $26,200.